DCEU president Geoff Johns has shared his love for Marvel's Black Panther trailer. Last night was an exciting night for comic book fans, and an underwhelming night for basketball fans. 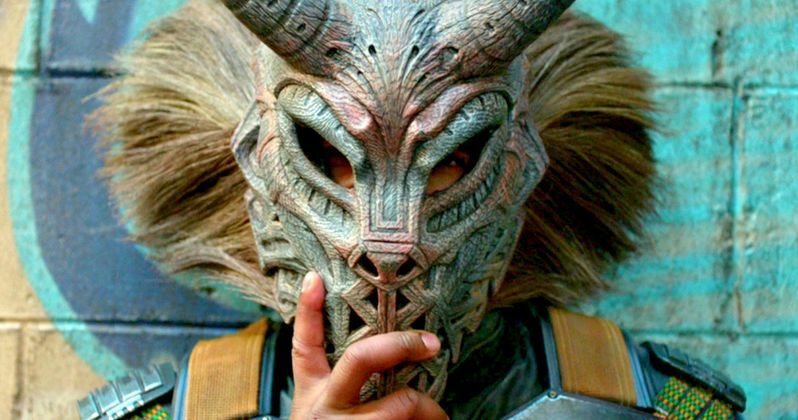 The world premiere trailer for Black Panther took place during game 4 of the NBA Finals, finally giving fans a peek at what director Ryan Coogler's Black Panther will bring to the big screen. And it looks fantastic. Coogler's vision of Wakanda is stunning, something that will have to be seen on the big screen to fully appreciate. Fans were immediately excited about the 2 minute trailer as social media was set ablaze seconds after the initial airing of the clip. DCEU president Geoff Johns can be counted as one of those fans. Johns worked for Marvel in their comic division in the early 2000s, writing most notably for The Avengers. Johns took to his official Twitter page to share his feelings about the trailer, even sharing that Black Panther was one of his favorite characters to write for when he worked for Marvel. Read what Johns had to say below. "This looks unreal. Panther was one of my favorite characters to write when I was at Marvel." Johns tagged Marvel and actor Chadwick Boseman in his post. Marvel and DC have been patting each other on the back quite frequently lately, much to the chagrin of fans looking for a feud between the two universes. DC's Wonder Woman opened last weekend to rave reviews from critics and fans alike while simultaneously garnering respect from the Marvel team. And now DC is returning the accolades with Johns leading the way. The excitement for Black Panther is just getting started and the trailer last night has brought anticipation to an all-new high. The Black Panther trailer sets up some of the major plot points for the movie and shows off some action like the fact that the world around Wakanda is changing as more focus is thrust upon the advances of Wakanda. Within Wakanda, T'Challa is shown dealing with Erik Killmonger rebelling against the royal family. The Dora Milaje looks like it's going to be a force to be reckoned with. The end of the trailer shows Black Panther doing an incredible flip from one moving vehicle onto another. The finer plot points are still unclear, which is a good thing. We don't need to see all of the best bits in a 2-minute trailer. Black Panther will also be seen in the upcoming Avengers: Infinity War alongside Man-Ape, but details are scarce on what exactly Man-Ape will be doing in the movie, though it has been speculated that Thanos may come to Wakanda on his quest for Infinity Stones and might get into a scuffle with Man-Ape and Black Panther. Marvel's Black Panther opens in theaters worldwide on February 16th, 2018 and is sure to be another hit for the MCU. Chadwick Boseman's portrayal of T'Challa is already looking impressive, even in a 2-minute clip.